Every couple of weeks or so I go into the Western Australian Museum library to look over the new journals and see if anything interesting has come out that I've missed. I did so this morning, and among the papers I noticed was van der Meijden et al. 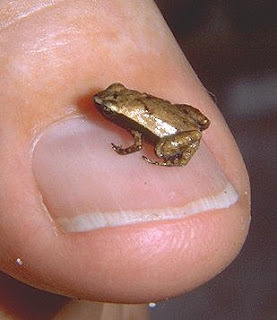 (2007) in the Biological Journal of the Linnean Society which established a new genus Leptosooglossus for the frog species previously known as Sooglossus gardineri from the Seychelles (shown above in an adorable image from the Nature Protection Trust of the Seychelles). A second species, Sooglossus pipilodryas, was also transferred into the new genus. This was all well and good, until a few journals later I came across Nussbaum & Wu (2007) in Zoological Studies which established a new genus Sechellophryne for the frog species previously known as - yep, you know what's coming - Sooglossus gardineri (again, So. pipilodryas was also transferred). Oh dear. Two papers, published very close together in time, coining different names for the same thing. Before anyone madly leaps to any suspicions, I can't find any obvious signs of plagiarism or claim-jumping in either paper. Both recognised the new genus on the basis of paraphyly of the genus Sooglossus, but van der Meijden et al. only used molecular data, while Nussbaum & Wu only used morphological data. It does seem somewhat incredible that there could be two separate groups of people both working on as small a group as Sooglossidae (only four species restricted to the Seychelles, a small group of islands in the Indian Ocean roughly the size of a postage stamp) and unaware of each other, but I can't find any obvious indications otherwise (if there is any sort of scandal, I'm chucking in a vote that it be referred to as 'Bubblegate'). It is good that the two papers using completely different methods agree so much in their results. So the next question becomes - which is the correct name to use? The van der Meijden et al. paper was in the July issue of the journal it appeared in, while Nussbaum & Wu appeared in a May issue. So the first round would appear to favour Sechellophryne over Leptosooglossus. However, the cover date of a journal issue is not necessarily identical to the actual print release date, which is what is supposed to determine priority. The online release date for van der Meijden et al. (which may not be identical to the print release date, but is usually at least an indication) is given as 5th July at the journal website. Unfortunately, the website for Zoological Studies doesn't appear to list specific release dates, and there doesn't appear to be one on the paper. If anyone out there in the know is able to confirm the release date for me, I would be quite grateful (it suddenly occurs to me that I should have looked inside the cover or on the table of contents or such of the journal itself, but I'm no longer at the museum and can't do that now - d'oh!). Again, at the moment Sechellophryne appears to be the senior name unless proven otherwise. Three frogs are brought before the court. As the first frog is taken to the stand, the judge asks the bailiff for his name and crime, to which the bailiff replies, "This is Frog, and his crime is blowing bubbles in the pond". The second frog is taken in, and again the judge asks for his name and crime. The bailiff replies, "This is Frog-Frog, and his crime is blowing bubbles in the pond". The third frog is then brought in, and the judge asks, "I suppose this is Frog-Frog-Frog?" "No," replies the bailiff, "this is Bubbles". Meijden, A. van der, R. Boistel, J. Gerlach, A. Ohler, M. Vences & A. Meyer. 2007. Molecular phylogenetic evidence for paraphyly of the genus Sooglossus, with the description of a new genus of Seychellean frogs. Biological Journal of the Linnean Society 91: 347-359. Nussbaum, R. A., & S.-H. Wu. 2007. Morphological assessments and phylogenetic relationships of the Seychellean frogs of the family Sooglossidae (Amphibia: Anura). Zoological Studies 46 (3): 322-335.
Who said that taxonomy was a boring (and uncompetitive) field? I'm Arie van der Meijden (yes, from the sooglossid paper) and I can confirm that we were completely unaware of the Nussbaaum and Wu's efforts. Since I submitted the manuscript in october 2005, I was really sorry to see we were scooped on the genus name, and we produced a junior synonym. Another confusing thing that the world could do without! Arie: I'm glad to hear that there wasn't anything other than bad luck involved in the double naming. The synonymy of the name doesn't reflect anything about the quality of the work in the paper, of course. Aydin: Taxonomy boring and uncompetitive? NEVER! Maybe I should get someone to design a "Taxonomy is War" t-shirt for me. I haven't seen either papers yet, but have you checked their doi codes? It's been argued (Harris 2004)that these can be used to determine priority in cases like this, especially when the 'print date' of the paper version of a journal is often hard to confirm or be sure about. You write awesome posts by the way. 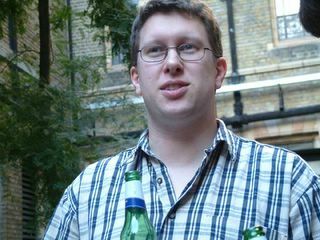 Harris, J. D. 2004. 'Published works' in the electronic age: recommended amendments to Articles 8 and 9 of the Code. Bulletin of Zoological Nomenclature 61, 138-148. I have seen those frogs in Perth Western Australia. Can you tell me if they are rare. They were in a storm overflow in the Carine area. The frogs you saw were exceedingly unlikely to be sooglossids, which are restricted to the Seychelles island group of the coast of Africa. Australia does have a very diverse fauna of frogs of its own, however. Frogs of Australia is a good website that may help you identify the frogs that you saw. Many Australian frogs are significantly endangered, though I don't known if any endangered species are found in the Perth area.